Roma, semifinalists last year, were beaten 4-3 on aggregate after losing Wednesday's second leg 3-1 in extra time, the decisive goal coming from a penalty awarded with after a VAR review three minutes from the end. "We were within touching distance of penalties and a chance of getting to the quarter-finals for a second year in a row." Roma defender Kostas Manolas said the referee and VAR were "a disgrace" in not giving the Giallorossi a late penalty, just minutes after the technology had been used to award Porto a spot kick which proved decisive. 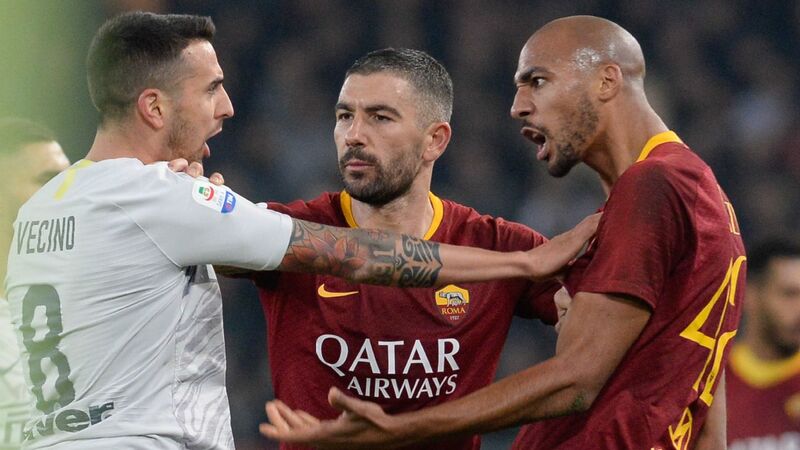 "They give a penalty against us and not one for us which was clear -- the referee didn't even go to see it, which is a disgrace," Manolas told Sky Sport Italia "There was clear contact and I really don't understand why these things only happen against us. "It was the same last year, that they didn't give us two penalties [against Liverpool in the semifinals]. The referees apologised to us then, but now there's the VAR and he's got to go to see it, there's no excuse." De Rossi said he did not want to enter into the talk about Di Francesco's future. "I hope we continue with him," he said. "I don't know what will happen but nobody can take away from him what he has done. Tomorrow, we will work with him and then the club will decide," he added. Forward Diego Perotti agreed that the team wanted Di Francesco to stay. He said: "We've always given everything for him, it's a bad moment for all of us. We are all with him."